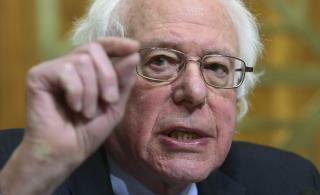 (Newser) – Sen. Bernie Sanders says that in some ways, Robert Mueller's report on Russian election meddling isn't news to him—because he knew before the 2016 election that his supporters were being targeted by people seeking to "sow division within the American people." Sanders tells the Des Moines Register that aides noticed a rise in "horrific and ugly things" online in September 2016, after he'd already started campaigning across the country for Hillary Clinton. "In my case, it was to tell Bernie supporters that Hillary Clinton is a criminal, that Hillary Clinton is crazy, that Hillary Clinton is sick—terrible, terrible ugly stuff—and to have Bernie Sanders supporters either vote for Trump or Jill Stein or not vote at all," he says. He warned the Clinton campaign- did he let the FBI know? How about the entire intelligence apparatus of the US government? How about the MSM so people could have been warned to do checks on things they read/hear during the election cycle. Nope- speak up after the fact to get his face on the screen again. Just some more flotsam/jetsam rising from the swamp. *eyeroll* Our votes weren't rigged, period. If a candidate got swiftboated, oh well, play the game better next time. Information campaigns, false or not, have been going on forever to win elections, whether by TV, newspaper, or internet. That's freedom of speech.